It’s time for our weekly trip through the grand, gross, weird, wild, and wonderful world of Alaska politics. Here we go… It’s Friday in the Sun! Tsk Tsk — From the Campaign Finance Violations Nobody Notices file comes the fact that South Anchorage Assembly candidate Albert Fogle has neglected to include the occupation and employer information for donors on his 24-hour APOC reports. On his first 24-hour report he received $250 donations from Portia Babcock and Ralph Samuels, both of whom’s employment information is pretty well known. Albert, you better get your docs in order or APOC will threaten you with a $23 million fine and then reduce it to $2.30. Who wants to go through the hassle of writing a check that small? Speaking of Hollow APOC Threats — Remember back when we told you David Darden — no, not Dustin Darden, his brother David — was going to challenge the city clerk’s ruling that a person can’t run for two Muni offices at the same time, only to have Darden drop the ball and not actually file? 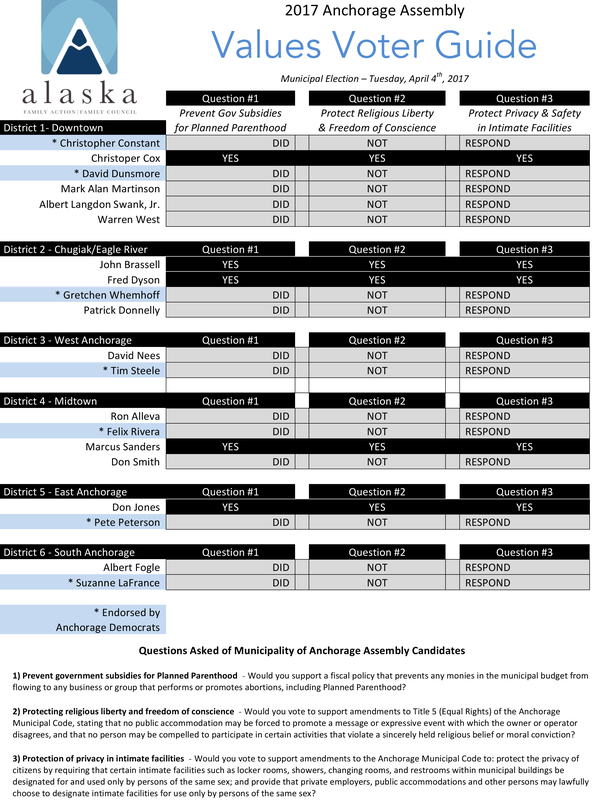 “At this time you are missing two 30 Day reports for the Anchorage Assembly and School Board seats that you filed Letters of Intents for on February 10, 2017. Because you have filed two separate candidacies with our office you are subject to Alaska’s campaign disclosure law, regardless of your status with the municipality of Anchorage. The problem is, they haven’t reported any spending on signs or any of the ads on their APOC reports. They reported $12,000 for “advertising,” but there’s no way they got that amount of tv, radio and internet ads and signs for $12,000. Also, if you look at the sign, you can see there is no “paid for by” declaration, also an APOC violation. Hey, taxi guys, this blurb could have been worse: I could have talked about the ridiculousness of the argument that opening up more taxi permits will somehow increase fares and reduce taxi availability. But I’ll be kind and not go there. Not only did Sanders return the survey, he answered it 100% in line with the Family Council’s positions. The bottom line here is longtime conservative fixture Don Smith can no longer be considered the only guy taking votes from the right in that Midtown assembly race. That is pretty good news for Felix Rivera, who has the lefty votes all to himself. 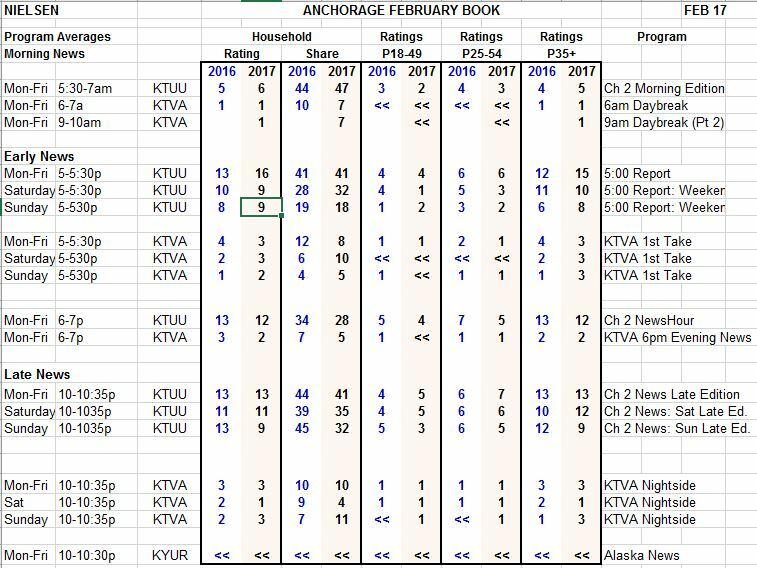 What’s On — The February sweeps ratings are out for Anchorage’s TV news market. It’s the same story we’ve been seeing since forever: KTUU dominates, KTVA struggles to hit double digits and be relevant, and no one else matters at all. Turnout — There has been a lot of speculation (OK, it’s mostly been speculated by me) that the lack of interest and energy in this year’s municipal elections, mixed with lingering political PTSD from the national elections last fall, will result in deplorable voter turnout on April 4th. According to the Muni’s Deputy Clerk Amanda Moser, there are some signs that prediction is coming to fruition, though it’s too early to say definitively. Last year, the Muni saw a 24.7% voter turnout. That is actually higher than any Assembly election turnout Anchorage has seen in quite a while. As of yesterday, 2,577 people voted early in-person this year, which Moser says is a decrease of 200 from the same time last year. That is a 7% drop. She also said there were 3,111 mail ballots requested, but “not a significant amount” of them have come back yet. The problem is that may indicate a poor turnout or it may simply reflect a change in Muni procedure. In the past the Muni sent all of the vote-by-mail ballots out on the first two days they were allowed to, but this year they’ve been sending out a daily stream of smaller batches over the last couple of weeks. So there are plenty of people just now getting their ballots in the mail. Based on the early numbers, this Assembly election is on pace to be on the lower end of normal turnout with the potential to be significantly below normal. The real question is how energized people will be to come out and vote on election day. That’s when the vast bulk of ballots are cast in local elections. Tease — Check back with The Midnight Sun next week. We’ll have some fresh polling on who has a real shot at winning the Governor’s mansion in 2018. That includes the Governor himself. 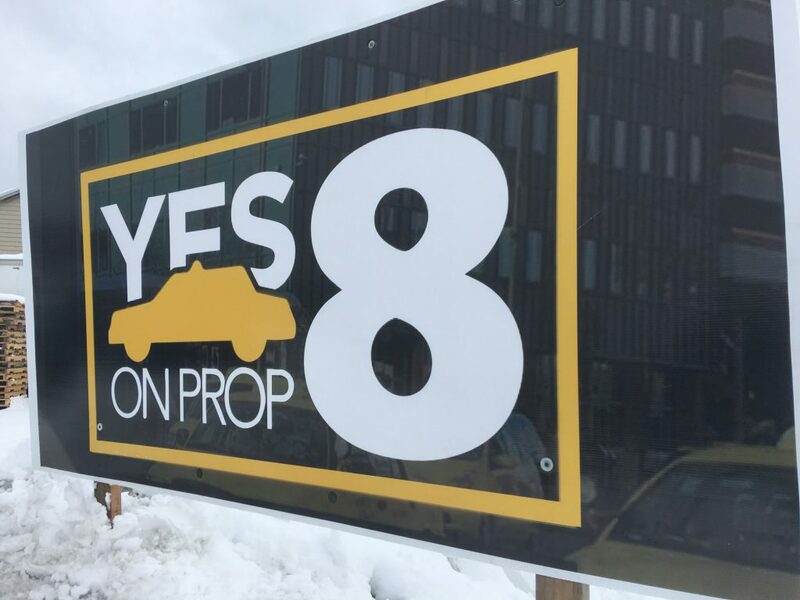 Chasers — You rarely, if ever, see a group organize to stop a specific bond proposition on the local ballot, but this year a group including Dimond Center owner Hugh Ashlock, Bob Griffin, Dan Coffey, with former Mayors Dan Sullivan, Rick Mystrom, Tom Fink, and George Wuerch, has come together to oppose Prop 2: The Ambulance Bond. That seems like a weird thing to oppose, let alone get all riled up about. You can hear their reasoning in this radio ad, which just hit the airwaves in the last 24 hours. 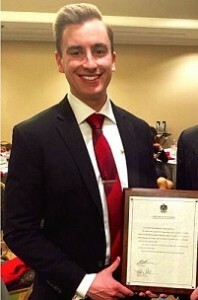 Movin’ On Over — Communications staffer Hans Rodvick is changing jobs. He’s been working for the Oil and Gas Committee of the Alaska Republican Party, errr, I mean the Alaska Support Industry Alliance, but will move over to working as a legislative assistant to House Minority Leader Charisse Millett. That position opened up due to the departure of Jeff Turner to Anchorage PR firm MSI. Paaaaartay — Elections are on Tuesday, so the really important question is where are all the election night parties? Well, the Anchorage Clerk’s office is helping things out considerably by putting together Election Central (EC) at the Dena’ina Center. If you just want to watch the fun but don’t want to go to a strictly partisan affair, EC is where you want to be. Alaska Republican Party — Black Top Pizza (probably in the back room formerly known as Sub Zero) starting at 7 PM. Chris Constant and Felix Rivera — 2nd floor of the Hard Rock Cafe, starting at 8 PM. This is sounding like it will be the default event for Democrats on election night. Don Jones — He is having what he is calling a “Pre-results Party” at Thai Village from 6:30-8 PM. After that, he and his crew will be heading down to EC to watch the results roll in. All of the other candidates I talked to were either having small gatherings of family, friends, and campaign workers, going to EC, or will just be staying home. Appointment Listening — Join the throngs of The Midnight Sun The Podcast listeners who wait eagerly for the latest episode to drop every Sunday morning. If you aren’t already addicted, you soon will be. This week Forrest Dunbar and I will be joined by ADN reporter Devin Kelly to discuss what is happening in the local races just days before the polls close. Cold Hearted — Chugiak/Eagle River Assembly candidate John Brassell actually told KTVA in an interview that the Muni is doing too much to help the homeless in Anchorage and that it’s an issue that should be left to the private sector. Doesn’t the game Monopoly teach us that,t short of government intervention, in a capitalist society one person would end up with everything and everyone else would be bankrupt? But don’t worry about the poor, I’m sure Burger King and BP are on it. Be the first to comment on "Friday in the Sun!!! (March 31)"